Why am I writing about Ketchup? Not normally a product associated with ethics in the food industry. Well this family staple serves as a great example of the how to assess the real value of the food we buy. It is easy to look at the label, see organic and think hmm, ‘it might be slightly better’, look at the price and wonder if it is worth the difference. So what is the difference? The difference is huge! 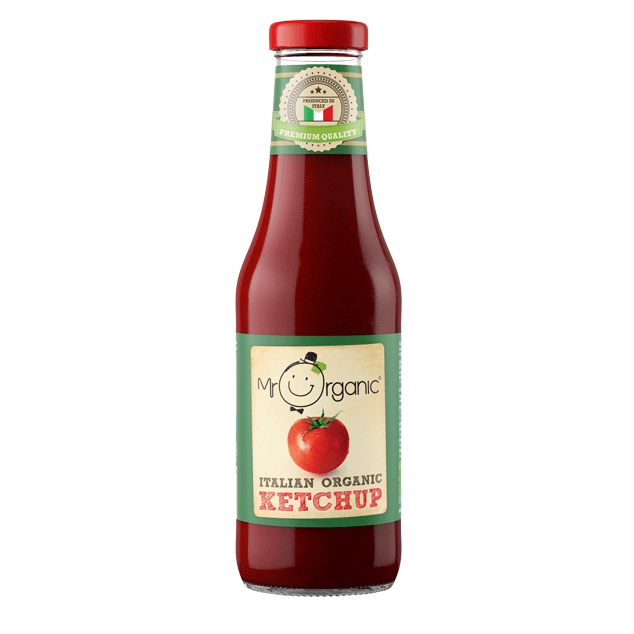 There are 600g of tomato per 100g of Mr Organic ketchup. Compare that to standard Heinz at 148g per 100g, Heinz organic ketchup 180g per 100g and a similar price to Mr O and Tiptree which is considered a premium brand (By appointment to Her Majesty The Queen) coming in at the highest cost per KG, but still only 180g per 100g. Tesco value is 116g per 100g so the smart money is to either buy a supermarket value product or to buy a branded product that really is a quality product and worth the extra money. It is worth looking past the labelling and questioning what a brand represents. Overall, because it is so rich we end up using less so the cost equals out. I’d never buy anything else now. If I am honest I am a bit in love with Mr Organic, he is my kind of guy! Parting thoughts – Some companies put a lot of money into marketing and branding with the focus of driving up profit and others companies create a product they are really proud of. That is the one that is worth the extra cost. With everything you buy, look to support producers that have everyones best interesting in mind and are genuinely passionate about creating a great product. A delicious veg based alternative to beef Bolognese. All dishes that are traditionally made with meat mince can be made with pulses; shepherds or cottage pie (try https://wp.me/p7RDjy-52), chilli (try https://wp.me/p7RDjy-fk) . A very healthy dish, great to aid weight loss, by reducing fat and calories, whilst increasing nutrients and fibre. Pulses are super cheap so it is also a good way to improve you diet and watch your budget. 500g dried Puy lentils – follow the instructions on the packet, e.g. soak in cold water for at least 20 mins, I leave mine longer and refresh the water a couple of times. Finally drain the water and rinse. Cover with fresh water and bring to the boil, follow instructions on the packet, typically 40 mins. Drain and rinse, set aside. heat a pan, medium heat, add a splash of apple juice (use oil if you prefer). Finely chop a large onion and add to the pan, sweat for 4-5 mins. Crush and chop 4 cloves of garlic add them to the pan and sweat for a further 1-2 mins. Finely chop 2 large carrots, 1 medium sweet potato (optional) and dice 3-4 large tomatoes add to the pan, with enough water to keep it wet (use a can of tinned tomatoes if easier). Cover and cook on high heat for 5-10 mins. Add a generous sprinkle (3-4 pinches or to taste) of italian style herbs – basil, thyme, oregano, rosemary bay. Use dried or fresh. Add approx 400ml tomato passata. Optional for extra flavour – add 100g finely chopped sun-dried tomatoes or 30g paste and or a glass of red wine. Add salt and pepper to taste or leave for people to add themselves. Remember most stocks have salt so air on side of caution. Add veg stock, just enough to cover the mixture, put the lid on and bring to the boil, then turn down to a simmer. Simmer for at least 30 mins. Check to make sure it doesn’t stick or dry out, add more stock if needed. Past the 30 mins continue to cook for as long as you want, depending on how soft you want the veg to be. The longer you cook the more the flavours will mature. Serve with pasta and / or garlic bread. If you are making the dish as a plant based dish or for vegans use dried pasta as fresh pasta often contains egg. For healthy option serve as it is as a complete dish without pasta, or with a green salad or cooked greens such as broccoli, Swiss chard, kale. Once cooked you can leave it and reheat later. It will keep for around 5 days in the fridge and freezes very well. Would you like extra fat with your chicken breast sir. A serving of muscle disorder perhaps? Known as white striping, it is a condition that affects nearly all chickens raised under intense conditions (factory farming). Look at any packet of supermarket chicken breast that is not free range or organic and you will most likely see it for yourself. White striping has become common in recent years. According to a 2016 study by the University of Arkansas and Texas A&M, after testing a total of 285 birds, the study found that 96% had white striping. This is a similar picture in the UK and Europe where the same type of hybrid birds are raised for meat under the same conditions as in the US. It is visible as white striations parallel to muscle fiber on surface of breast. The birds suffer from a muscular disorder, similar to muscular dystrophy, due to the way they are raised (all they really do is eat), they double the size in half the time, genetically manipulated to make them bigger than nature intended with around an 80% increase in the amount of breast meat. Lower quality meat overall, with woody breast also often being present, making the meat chewer as well as fattier. White striping is considered as moderate to severe, any white striping has the same effects to varying degrees. Good chicken isn’t cheap and cheap chicken isn’t good. You don’t have to have a degree in biology to understand that encouraging chickens to eat 23 hrs a day, giving them little room to move and growing them to full size in 35 days isn’t good for anyone. How do you avoid white striping? Don’t buy intensively farmed chicken in any form; in the supermarket, in a restaurant, as fast food, in a sandwiches. Remember if it isn’t labelled free range or organic it is intensively farmed. Farm fresh, corn fed, Red tractor, it is all intensively farmed. RSPCA assured is a higher standard and a better choice, but still indoor farmed. In the supermarket choose free range or organic chicken. Pheasant breast is a very good alternative to chicken, available of line or if you live in a rural area and can find the butcher that processes game meat if it a very good option. I’ll write a separate post about pheasant. Parting thoughts: We don’t like problems we can see. Take hock burns, a lot of producers deal with it by cutting the lower leg joints off, so rather than fix the cause, they cut it off so you can’t see. The industry hasn’t found a way to ‘get rid’ of white striping yet, but we sure they are working on it. Sadly it won’t be by improving conditions and dealing with the real cause, the focus will be on whether you can see it or not. It is the choices you make that have the highest impact on the behaviour of the industry. Organic milk and dairy – why? ‘If there is one organic product you should buy, it is dairy’. Not all milk is created equal. There is a lot of variation in the way milk is produced and a lot of negative press coverage about dairy farming. The life of a dairy farmer is very tough and more so during recent years, due to a global excess of milk supplies, super market price wars and increased livestock animal feed prices. Our part as the consumer is to recognise good farming practices and support those farmers to protect our dairy industry. In this post I focus on organic dairy specifically. Buying organic milk is the easiest way to be sure that you are buying a higher standard of milk. Let’s be honest milk is cheap, in most cases too cheap, it is a product we should value more. Organic milk is much better value when considering the quality of the product and cheaper than a lot of bottled water! At around £0.81 per litre (based on 4 pints). Organic milk accounts for around 5% of all milk sold in the UK with 1 in 4 homes buying some organic. All large supermarkets offer an organic milk option. Switching to organic milk would cost the average family of four just £1 a week. Remember dairy is all products made from milk; cheese, butter, yogurt etc. The same applies choose organic. The same also applies to goats and sheeps milk, it is all mass produced. Organic dairy is the premium standard, with farmers commiting to follow and be inspected according to strict guidelines concerning all aspects of production. Think of it as a guaranteed standard. There are several different organic standards in the UK but all fall under EU organic standards as a minimum. In this post information is from the organic standard set by the Soil association. More consideration for the calf, to create milk a cow has a calf once a year. Truly free range, organic cows spend much of their lives outdoors where they can graze naturally on a diet of grass and clover. On average, organic cows spend, 215 days per year outside, which is more time outdoors grazing than the average amount of time spent outdoor grazing by ‘free-range’ cows. Keeping cows indoors all their lives, is banned under organic standards. When they go indoors because of bad weather, all cows must be housed in well-bedded spacious yards. Organic through and through, organic dairy cows eat a 100% organic diet. Soil Association farmers must always feed their cattle at least 60% fresh or dried fodder, roughage or silage on a daily basis. Most non-organic British chickens, pigs and cows are fed with imported GM crops. GM animal feed is banned under organic standards. No routine use of antibiotics, Use of antibiotics remains more than twice as high in animals as humans. Soil Association standards ban the routine use of antibiotics and organic, free-range systems encourage healthy animals avoiding the preventative use of antibiotics. The use of growth hormones to increase milk production is banned in the European Union, and organic farmers are permitted only to treat animals with antibiotics when they are actually sick, not as a routine, preventative measure. We also know that high welfare, pasture based systems have reduced rates of infection and so less need for antibiotics in the first place. A better life from birth Soil Association standards have never allowed the sale of calves to continental style veal systems, and since 2010 our standards have specified that licensees must have a plan to end the practice of culling new born male calves. Dairy calves There are some practices that are inherent aspects of dairy farming. For instance, while under normal circumstances a calf would never be removed from its mother immediately after it is born, it is true that calves and cows are separated. This is normal practice across the dairy industry in order that milk is available for us to drink. Organic dairy calves are always kept in groups after their first week, outside when conditions allow and always with good housing and bedding. Organic farmers are permitted to house calves individually for the first seven days, provided they are able to see and hear other calves. Contented, healthy calves need companions, a healthy environment and plenty of milk, and our standards guarantee that these needs are met. Organic farmers feed their calves plenty of organic milk – preferably from their mothers – or use ‘nanny cows’ to suckle calves until they are weaned. Soil Association standards prohibit farmers from weaning calves until they are at least 12 weeks old. Dairy farmers are often faced with a dilemma about what to do with male calves, as they cannot be used for milk production. Some dairy breeds, such as British Friesians, can also produce meat, which means that they can be reared for beef production. Unfortunately, killing male dairy cows is something that happens on both organic and non-organic dairy farms, but it raises difficult ethical concerns. The Soil Association has long discouraged this practice, and we want to see an end to the unnecessary slaughter of male dairy calves. Drinking milk is not natural or necessary. We don’t need to drink milk or give milk to our children for health reasons. See https://wp.me/p7RDjy-77. Milk is naturally intended for babies, human milk for baby humans and cows milk for baby calves. All of us are weaned from milk when we can digest solid food. For humans to consume another animals milk in most cases cows, the cow has to have a calf. This calf becomes a byproduct. A dairy cow has a calf a year, her gestation period is 283 days, meaning that she is pregnant 78% of her adult life, and milked whilst she is pregnant. At the rate cows are milked in modern systems, this is considered equivalent to running a marathon on a daily basis. There are currently three main methods of milk production; organic, free range and intensive (mega or zero grazing dairies). Free range milk labelling is on the increase so consumers will have further choice. I will write a separate post on this.